While Sakaide Masami observing, Makigami Koichi played Shakuhachi in the Hikashu concert at National Drama Theatre, Golno-Altaysk, The Republic of Altai, on October 1, 2011. This year, Makigami Koichi got a new bag to play with. It's Shakuhachi, a traditional vertical bamboo flute of Japan. Along with Shamisen and Koto, it is one of the most popular instruments for Hougaku, the generic term of traditional Japanese music. A wikipedia entry of Shakuhachi is here. Shakuhachi has a long history. Some says its root could be traced back in 6th century. Legend has it that even Prince Umayado, a very famous Japanese politician from 6th century (wikipedia), played that one. Shakuhachi also has an image closely connected with calmness, serenity, and tranquility. This is mostly because it has been traditionally played by Komuso (wikipedia), a school of Zen buddhist monk. Shakuhachi is also widely used for contemporary music, in Japanese and western forms, especially classic and jazz. Takemitsu Toru - Eclipse (1966), a composition for shakuhachi and biwa. Yamamoto Hozan played Dave Brubeck's "Take Five." Yamamoto, living National Treasure appointed by Japanese Government, is one of the representative contemporary player of the instrument. He has also been very positive playing jazz, and has recorded with musicians like Helen Merill, Tony Scott, and Gary Peacock. Kitajima Saburo - Yosaku. An immensely popular tune of 1978 by the great balladeer. 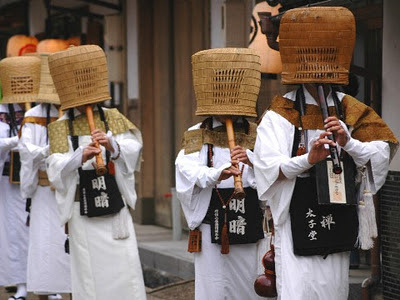 Shakuhachi is often used for popular music and this one is a nice example. In early 2011, Makigami prepared for the performance in Tuva in March for cultural exchange event, and he thought it's nice opportunity to start playing Shakuhachi because it's a representative instrument of Japanese music. But his choice is unordinary - he got a shakuhachi made in plastic. Normally, Shakuhachi is made from bamboo. It was just recent that plastic shakuhachi was introduced. Certainly it has some merit; fairly affordable, its sound is bright, and most of all, it boasts outstanding durability. Shakuhachi is not easy to maintain - in particularly, it's very easy to crack if air humidity is low. This fragility is often problematical, especially for playing the instrument outside Japan. One need not to worry about that with plastic shakuhachi. There's another problem; That is, shakuhachi is notorious being very hard to play. But this didn't apply to Makigami; he has been practicing a flute for more than 20 years (although he has never played it in public), and that helped a lot. He succeeded to made a sound immediately when he played it for the first time - and it's something exceptional. He soon started to use it at concert and recording, and we expect to listen to his shakuhachi playing on the forthcoming album of Hikashu which will be released in spring of 2012. 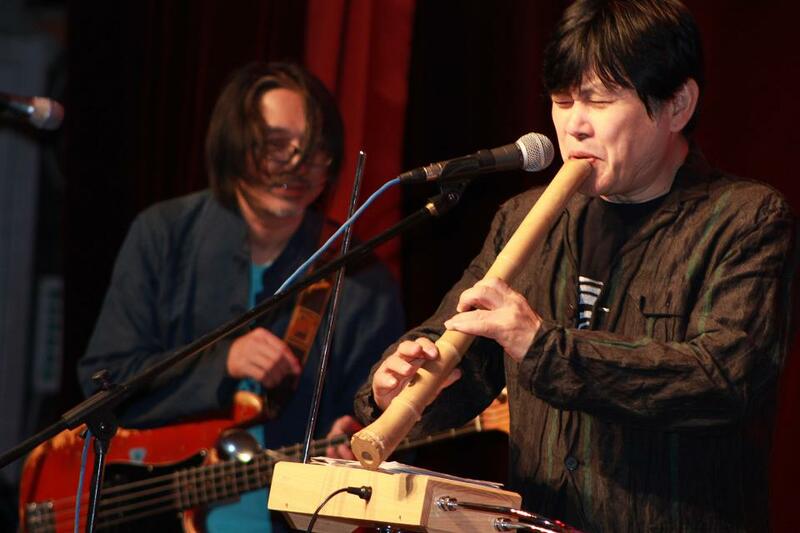 Makigami Koichi performed a voice shakuhachi with Ondar Mongun-ool in Tuva, March 2011. In 1996, Hikashu added two members, the drummer Niida Kozo and the keyboardist Yoshimori Makoto. So they became a septet. It is the biggest line-up in the history of the band, and "Kawatteru" is the one and only full album the band ever released. "Kawatteru" is sort of the best album; it is a collection of new recordings of the songs selected from the band's entire catalogue. But all the arrangements is revised and some are so radically changed it succeeded to give a refresh impression on old songs. For example, "At the End of the 20th Century" was recorded with five drummers playing simultaneously. This recording featured a group called "the Drummers," a percussion ensemble which Niida led at that time. Their participation gave the track thunderous effect. "Ningen No Kao" features the instruments of Hogaku, the traditional Japanese music. This version was arranged by Makigami who intended to do "punk rock with traditional Japanese music feel." The result is a unique one indeed - you cannot hear the thing like this anywhere else. "Nihon No Egao" has some delibarate variations of its theme composed by Torsten Rusch who also did the orchestration. This track was recorded in Slovakia - Mr. Rusch went to the country with the score and two ADAT recorders, managed to record the music with the orchestra in four hours, and returned to Tokyo. Then Makigami dubbed vocals. Actually, the arrangement is pretty complicated and very hard to sing along. Of course Makigami nailed it but even he admitted it was difficult. Anyway it turned out to be a great reinterpretation of the composition which once seemed perfect and unchangeable. The whirling sounds coming out of orchestra is so thrilling. 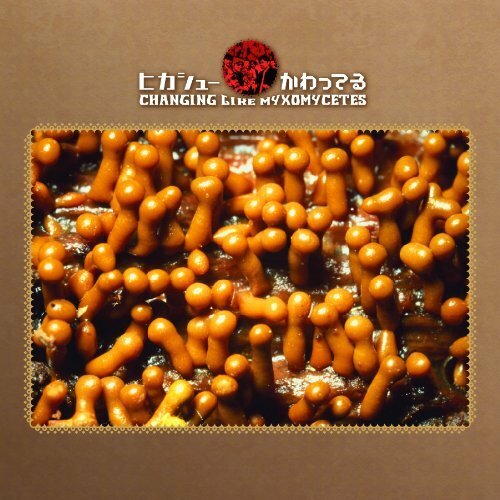 The album's cover and artwork features the photos of myxomycetes. According to Makigami, myxomycetes and Hikashu has some resemblances in essence. Myxomycete could be categorized both animal and plant. It is a very strange being intrinsically - so is Hikashu. The title's meaning - in Japanese, the word "Kawatteru" has two meanings: "strange; weird; peculiar" or "to change; to be transformed; to be metamorphosed." Makigami said both the meanings applied to the band, and the word was also appropriate for the album which is the re-recordings of the older tunes. Certainly this album is so changing and so strange. But it's beautiful too. And, as usual, the remastering by Ono Seigen improved its sound a lot. A nice addition to your sound library. Grab while it's hot. The year of 1996 looks prolific for Hikashu. 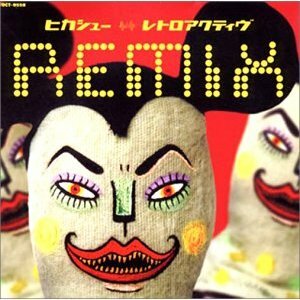 There were three releases of the group related; "Retroactive" in August, "1978" in November, and "Kawatteru" in December. And one thing to be pointed out - all those releases were from Toshiba-EMI, one of the biggest labels in Japan, and the company which signed the band for their first record contract, back in 1979. The contract expired in 1983, upon the release of a single "Watashi Wa Baka Ni Naritari" [I Want to Be Like a Fool]. In 1998, Makigami Koichi produced a tribute album of Kraftwerk for the label, and it included two tracks of Hikashu, but it was a one-shot deal. In October 2011, the remaster edition of "Kawatteru" was issued and it included a note written by Makigami. It revealed some interesting facts so we would like to paraphrase it here for you. By the way, the note's title is "Why we had to re-record our old songs in late 1996 - What we really wanted to do at that time was to record a new album, and actually we tried to do that but didn't succeed." In spring 1996, an A&R man from Toshiba-EMI approached the band. He had an idea - releasing a remix album of early Hikashu recordings by up-and-coming techno artists. At that time, the band had no record contract. Their last release then was "Acchi No Me Kocchi No Me" [Dazzling Eyes] in 1993. In the meantime, they performed regularly and wrote new songs. In beginning of 1996, the band spent some time at studio and tried to make some demos for an album, with no particular label for release in mind. So there was no contractual obstacle for that remix thing. At first, Makigami was dubious. To him, the whole idea just sounded not worthwhile. But he finally agreed and consented to access the original multi-track master by the remixers. He was still reluctant, but thought that it might attact new audience from younger generations. Also, there was a tacit understanding between them - if it turned out good, a new album might be recorded and released from the label. Around that time, Makigami was preparing to release their famous demo tape from 1978 for themselves, but Toshiba-EMI undertook the title as a publisher. Then, releasing a best album was proposed. Makigami was hesitated to that idea, too. It just sounded silly to him, and his top priority was a new thing. But he agreed to do that in time. He dared to commit, hoped it to taking the band's turn for the better. There was a tacit understanding between them - if everything went good, a new album was to be recorded. The remix album, entitled "Retroactive," released in August. It had nothing to do with the band, except being the original artist. All the Hikashu members did nothing on the album; selecting the artists for remix, supervising the sound and the artwork, all done by the record company. Makigami was not happy with the result. Actually, he disliked it and publicily said so. It was a understandable opinion because the album is just a remix for remix sake. Maybe good for the fans of the remix artists, but not for the original band's audience. The following two releases were welcomed by the audience of the band, but that's it. Regarding the "Kawatteru" album, the band was so intent on making it but the commercial result was not satisfying. The A&R man looked unconvinced, the idea of recording new album fizzled out. And we had to wait another album from the band for ten years. 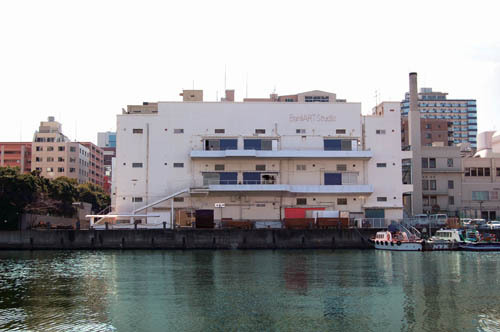 Formed in 1978, Hikashu has some changes in its personnel during their 30+ years of existence. The following is a chronologically listing of various line-ups of the band. This is not strictly accurate, and provide here only for referential purposes. The work is still in progress, and subject to be revised any time when needed. Hope this helps. Please note: "Release" is not complete, selected titles only. Strictly speaking, this is the original Hikashu. The group played improvising ambient music, sometimes flavored with ethnic timbre. They had no leader, also the personnel and the instrumentation were always in flux (only Yamashita and Inoue were the permanent members). Dissolved after several performances in public, they had never been in recording studio, but some live recordings are survived and later issued. Pre-Hikashu is the name dubbed afterward for making a distinction of them from the -other- Hikashu. The partnership between Yamashita and Inoue still continues. Also, Wakabayashi and Sakasegawa has been active as musician and educator to this day. This is the first line-up of Hikashu as we all know. From the start, contrary to Pre-Hikashu, the group had a leader, Makigami Koichi. All the members were Makigami's friends. At first he gathered them to make a musical accompaniment for his underground theater troup, Ulysses. They worked together nicely and Makigami decided to form a band instead of theatre, and concentrate on music. Upon a suggestion of Yamashita, the band called themselves Hikashu. In 1978, they rented a small house in residential area of west Tokyo, lived together, started composing, experimentating, and recording various demo tapes which were later issued as the 1978 album. Their communal living continued almost a year. There is a general impression that early Hikashu was a drumless group. But actually they employed several drummers at the first recording session for Toshiba-EMI in fall 1979, and started using a drummer for gigs in spring 1980. Sensui Toshiro is a drummer, played for various new-wave bands including Halmens and 8 1/2, and he became the first regular drummer for Hikashu in autumn 1980. In late 1981, Tobe decided to quit the band, and retired from music. In early 1982, Makigami recorded the first solo album with Hikashu, plus some guests. In late 1982, Sensui decided to quit the group. Since his departure, the band had been using various drummers (and saxophonists). This mobilization of the personnel continued for several years. Sakaide Masami, a young session musician, joined the group in December 1982. So Makigami no longer had to play bass and concentrate on vocal and cornet. In Februrary 1983, Yamashita parted with the group and decided to pursue different direction of music. His partnership with Inoue continued under a new name, Inoyama Land. Around this time, Inoue started solo activity called Godzilla Legend. It was a reinterpretation of the music from classic Japanese monster movies, and all the Hikashu members participated in it. The response for the project was enormous, and it spanned three albums and a video eventually. Nomoto and Taniguchi already took part in recording sessions of Hikashu circa late 1983. It could be interpreted that they officially joined the band in 1985, because "Soba De Yokereba," released in that year, they were credited as regular member. Unfortunately, "Ningen No Kao" is the only full album by this line-up since Taniguchi suddenly passed away in 1988. It was a tremendous loss for the band. "Live," a selection from various live recordings in 1987-1988, was a release dedicated to his memories. Tsuno, a young jazz drummer, joined the group. In 1990, Otomo came to play with the band through Nomoto, his old friend, and had been a regular member only during that year. Around 1991, Mitama Masamichi renamed himself as Mita Freeman. Inoue, an original member, left the group. His replacement was Torsten Rasch from Germany. Circa 1995, Tsuno left the group. Niida Kozo, a veteran rock drummer mainly known for his tenure with a popular rock band called RC Succession, and Yoshimori, a young keyboard player, became the regular members. Shortly after leaving the group in 2002, Nomoto passed away by cancer. In the same year, Yoshimori left the band too. Torsten Rasch decided to go back to Germany, then Makigami recruited Shimizu and Sato. They were veteran musicians, mainly known for their activities in progressive rock and improvised music scene. So, for a while the group had two percussionists. Then Niida left the group in late 2004. Around this time Makigami started playing a theremin in public, after several years of preparation. This is the current line-up of Hikashu. The history continues. 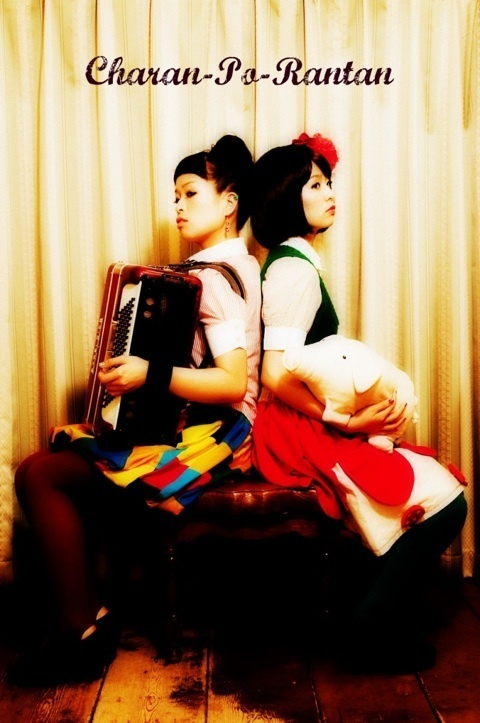 Charan-Po-Rantan is a sisters duo, consists of an accordionist and a singer, formed in July 2009. 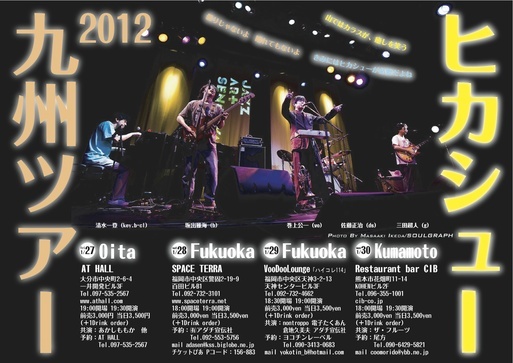 They performed at the Hikashu's Tokyo concert on December 25, 2011. Koharu, the older sister, was interested in accordion at the tender age of 7. Soon she got a one for herself and started to play. Since then, as a proficient musician, she has got many awards. For example, she was chosen as the best Japanese player of the year at Roland's v-accordion contest in 2009. Shortly thereafter, she teamed up with her younger sister, Momo, to form a duo and billed themselves Charan-Po-Rantan. Now they have been active as a live unit mainly in Tokyo area. In August 2010, Charan-Po-Rantan released their first album "Tada Soredake," recorded with a brass group called CanCan Balcan. The album is available worldwide via HMV Japan - see here. Charan-Po-Rantan with Cancan Balkan - "Mustafa" A cover of a traditional Egyptian folk song called "Ya Mustapha." Japanese singer Sakamoto Kyu made this song a hit in 1961. Charan-Po-Rantan - "Hymne à l'amour" on April 24, 2011 Yokohama. Jintara-Mvta, Charan-Po-Rantan, and Cancan Balkan - "Lively and Happy" January 31, 2012 at Star Pine's cafe, Kichijoji, Tokyo. Koharu plays a series of popular tunes. See hear her virtuosity of button accordion. She was just eighteen years old then. 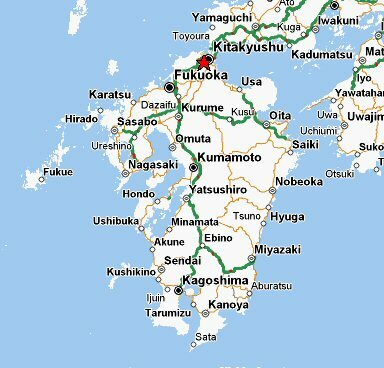 It just announced that Hikashu will do a Kyushu (wikipedia) tour in January next year. The place was packed. A corner of the ground floor, a huge warehouse at seaside in Yokohama. It was like a spacious gallery, but the ceiling was exceptionally high, and there was no art piece hanging on the wall. There were about 50 people sitting on chair, and they was surrounded by more people standing. Everybody was gazing a man at the bottom of the space. The man was Makigami Koichi, dressed in all black, making various non-verbal noises out from his vocal apparatus, while watching a wide paper in front of him. And everybody was silent and watching the man anxiously, including the author, Christian Marclay himself, who sat in the first row. It was a premiere performance of Marclay's grandiose piece called "Manga Scroll" in Japan. Manga Scroll is a collage work. The author choose many onomatopoeia in comics, all from translations of Japanese comics, then placed them on a scroll which is 18 meters (60 feet) long. For public performance, a vocalist is to recite onomatopoeia watching on "the score," while two assistants are to roll up the scroll. For the Japanese premiere, Makigami Koichi was chosen as a performer. It was taken as a matter of course. For such an important task, undoubtedly, he is one of the best persons around. Besides being a world-class vocal performer himself, he started a singing career professionally as a lead vocalist of a band called Hikashu, and the band's early repertoire included songs having onomatopoeia as its title, namely "Puyo Puyo" and "Doro Doro." Such conduct is pretty unusual, even for Japanese, and he has been singing them for over thirty years. The event itself formed part of a big art event called Yokohama Art Triennale, and the demand was high. The numbered ticket for entrance started passing out a few hours before the event. People made a waiting line before then, and the tickets were quickly gone. Apparently there was overwhelming demand, and the staff had to deal with the problem. And their action was pretty appropriate; They changed the policy to admission free. So the place was congested. Everybody was quiet, but there was heated atmosphere. It was a quite challenge, even for Makigami. He had to see the score while performing. His solo performance is usually based on improvisation, and the piece was exceptionally long, and written in English. Eventually, the performance continued for 45 minutes. Many performers did the piece in the past, but most of them did it for about 15 minutes. Makigami's performance is one of the longest - probably only second to Phil Minton, who did it for an hour. When Makigami finished it, there was a huge applause. Fter the performance, the audience was allowed to see the piece in close, while the assistants rolling back it, and the people quickly flocked around it. It was like a graphic score. The characters were pretty decorated, and partly patterned. There were parts more than one stream of words. Although the piece was a reproduction, prepared for public performance, it showed clearly what it was like. Shortly after the performance, Makigami and Marclay were interviewed with journalists on the spot. Marclay was apparently glad - his response seemed positive. The people stayed there for long time, conversing what they just experienced, while seeing the piece. And that's how it ended. It was truly the event of a lifetime. Now an exhibition of the Marclay's works being held at Gallery Konayagi of Ginza. You can see "Manga Scroll," the real one, for yourself there. There is an article about the event. It was in Japanese but you can see some photos of the event. here.